Today I have the pleasure of announcing that we've won Gold at the Davey Awards for our work on the Camino Global website! The award was given in the category of Websites/Online Marketing - Charitable Organizations (end of the second row). The Davey Awards is exclusively for smaller agencies, companies, or organizations with annual billings or revenues below certain levels. The awards are sanctioned and judged by the International Academy of the Visual Arts (the same organization who run the Webby Awards), an invitation-only body consisting of top-tier professionals from a "Who's Who" of acclaimed media, advertising, and marketing firms. 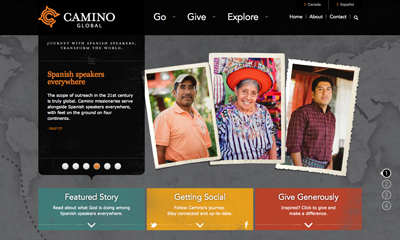 We are honored to have won, but also know that this win couldn't have come without our friends at Camino Global, who not only entrusted us with their rebranding efforts, but also worked with us throughout the design process to arrive at the communications package that they have today - now featuring an award-winning website! So congratulations to Camino Global for this win and another big thank you to them for giving us the chance to work with them as they endeavor to radiate their ministry brand with excellence!